Kampala, 10th/March/2017, The Chief Magistrates Court at Buganda Road has found the former Division Police Commander (DPC) of Old Kampala, Joram Mwesigye guilty of assaulting a WBS Television journalist, Andrew Lwanga. He has been fined (Sentenced) one million shillings (USD 282), and Five million shillings (USD 1,409) compensation to the assaulted journalist which he has to pay in 30 days. If Joram fails to make the payments within 30 days, he will serve one year in prison. The journalists present at court reacted angrily to the sentence, describing the process as a miscarriage of justice. Court parked to full capacity, presided over by the Buganda Road Court Grade One Magistrate Gladys Kamasanyu acquitted Joram on two other counts of malicious damage to property. Lwanga accused Joram of damaging his camera whereas Ssetimba of Bukedde TV accused Joram of tearing his trouser. 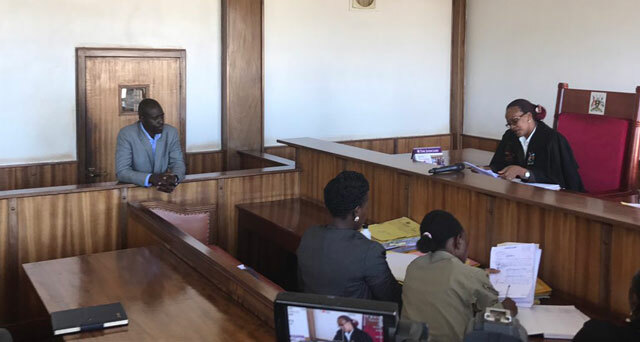 However the former DPC Mwesigye Joram was acquitted on these two counts of Malicious damage to property, with Court ruling that there was no proof of ownership of the said items, like receipts by the prosecution led by Patricia Chingitho. Her Worship Kamasanyu based her conviction on the evidence of four prosecution witnesses that included three journalists, a television librarian who tendered in a video footage and a Doctor that examined Andrew Lwanga. The magistrate said that she viewed the footage tendered by the librarian of NTV and ruled that there was absolutely no reason why Lwanga was assaulted since he was properly identified in his blue WBS TV T-shirt, busy doing his work. She said that the journalists properly identified Joram as the one who was wearing a Kaki police uniform with his name on it, holding a stick that beat up Lwanga. She noted that Lwanga was deeply hurt and his body was tampered with; he sustained injuries on his head, left ear and chest, thereby causing him actual bodily harm. The magistrate however handed Joram a light sentence saying he has been remorseful and regretful of his actions throughout the trial, on top of being suspended from active police service. Andrew Lwanga however described the process as a mockery of justice which would not help journalists scare away potential perpetrators.